A few years ago I saw Ennio Morricone at the Royal Albert Hall, on stage for the best part of three hours, delivering one of the most superb concerts I’d ever attended. It was a bumper year – I saw John Barry’s final performance there, and my small local theatre hosted Michel Legrand and his orchestra, an event which still amazes me for having even existed. Morricone is of course still writing, and his strange, ethereal score for Dario Argento’s ‘The Stendhal Syndrome’ has been echoed in his recent score for ‘The Best Offer’, a film I loved which the critics all hated. They’re hung up about dubbing; it doesn’t bother me if I’m wrapped up in the story, and this one was a killer. Morricone reprises themes beautifully, in the way that an author or a painter returns to favoured tones. 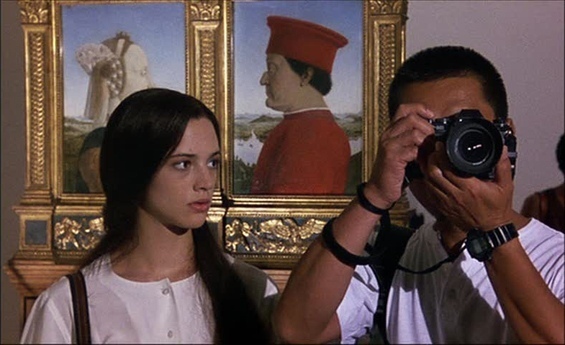 He perfectly accompanied the moment in ‘The Stendhal Syndrome’ where Asia Argento falls into Brueghel’s painting ‘The Fall of Icarus’, to the point where I can’t think of one without the other. There are certain soundtrack composers who aren’t afraid of writing simple hooks and using them as themes through their films; one thinks of Barry as the master, and Herrmann, whose score for ‘Twisted Nerve’ I owned on vinyl when its B side was taken up by the wonderfully cheesy ‘Les Bicyclettes De Belsize’ (Herrmann didn’t feel the need to slather every scene with music and wrote sparsely) but Morricone’s ‘la-la’ giallo scores often sounds if they’ve been written to set children’s nursery rhymes to. Here’s a tiny taste of that score, but you need to hear the full version on the album, which is sadly too long for me to post here. So glad you wrote this – I love him, and wish I’d heard him at the Albert Hall. Had to play a quick memorial track from the Venice concert when I read this – I watch the film of that concert from time to time. Yes, Morricone, like Sacco e Vanzetti forever in our hearts! By the way, again a bit late, have only just caught up with your well dressed Englishman post. While the idea of an account with Lock’s may be absurd, their hats certainly aren’t. I did a quick count just now, and find we have eight. All my husband’s. Have you ever looked at their front door? They never scrape the old paint off when they re-paint it, so it now has this wonderful texture, going back in time to the beginning, I imagine. What Is It About John Barry?